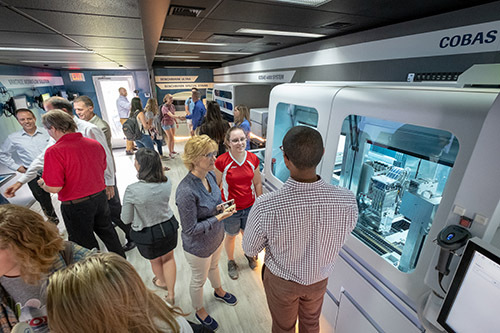 The University of Indianapolis and Roche Diagnostics, the world leader in in vitro diagnostics, are partnering to solve the talent pipeline for biomedical equipment technicians. The first Roche Academy cohort brings together eight students from Indiana, Illinois and Kentucky who will begin the program in the 2019-20 academic year. Established in 2018, the program is an innovative partnership that provides real-world training for biology and chemistry majors to create industry-ready graduates for high-demand positions with Roche Diagnostics. The Roche Academy offers a customized curriculum and summer internship experience focused on the hands-on life science and engineering skills necessary to succeed in a career with Roche. Students will receive training and skill-building opportunities, professional development, an internship and a full-time position at Roche upon successful completion of the program. Graduates will serve a critical need to Roche’s operations as they maintain lab equipment and provide customer service across the United States. “The Roche Academy is critical to our business. These career-ready graduates will not only bring fresh ideas to our organization but will also be mentored by tenured Roche employees to supplement our workforce with highly-skilled talent,” explained Russ Fellows, Roche Academy project leader. Debra Feakes, dean of the Shaheen College of Arts & Sciences, said the model sets a new standard for university partnerships with industry leaders to onboard fully trained employees. “Roche has been a fantastic collaborative partner as University of Indianapolis faculty identified a curriculum that will position students to excel in the classroom and in the field. 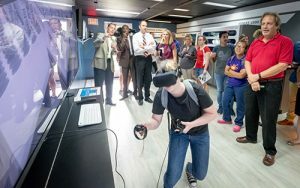 The University is thrilled to offer students this unique opportunity to develop a career path and apply new skills in a professional setting with built-in mentorship,” said Debra Feakes, dean of the Shaheen College of Arts & Sciences. The first cohort of students will complete a paid internship at Roche the summer of 2019 before gaining full employment at Roche in 2020. The Academy is expected to produce up top 20 biomedical equipment technicians for Roche annually. Brad Moon ’20 (biology major, chemistry minor); East Moline, Ill.
Megan Briley ’20 (chemistry); Martinsville, Ind. Will Durchholz ’20 (chemistry); Evansville, Ind. Michaela Heil ’20 (chemistry major, criminal justice minor); Indianapolis, Ind. Kiley Kenekham ’20 (chemistry major, biology minor); Brownsville, Ind. Michael “Blake” Chitwood ’20 (chemistry); Greenwood, Ind. Victor Inglima ’20 (biology and chemistry dual major); Brownsburg, Ind. The University of Indianapolis continues its leadership development program for Indiana high school sophomores with a statewide discussion February 16, 2019, bringing together more than 100 high school sophomores from around the region with interests in business, innovation and entrepreneurship. The event, “Embracing the Future,” hosted by University of Indianapolis Visiting Fellow and former Indianapolis Mayor Greg Ballard, promotes leadership skills by encouraging students to embrace change in a positive way; and is one of a series of initiatives throughout the year designed to prepare the next generation of Indiana’s leaders. Attendees are nominated by their high schools. Ballard will deliver a keynote address followed by afternoon sessions that touch on topics important to attendees’ personal and professional futures. The speech will explore the theme of democracy and how young people can become engaged citizens by educating themselves not just about the issues of the day but also about history. Ballard also encourages students to expand their network to learn different perspectives. “Learn from everyone around you, including those with whom you might have the least in common. We all bring our life experiences, our upbringing, our education to how we currently think and act. That is a strength of America, not a weakness,” Ballard said. Afternoon sessions include topics such as “Fail Fest” and “1 Million Cups,” a free, nationwide program designed to educate, engage and accelerate early-stage startups across all industries. Greenwood Community, Riverside, North White, Bremen, Ben Davis, Triton Central, Anderson Preparatory, Herron, Washington Township, Princeton Community, Mooresville, Western Boone, Tipton, Avon, Benjamin Bosse, Cascade, Jennings County, Crown Point, Frankfort, Signature School, West Washington, Roncalli, CoumbusEast, Brownsburg, North Putnam, North White, Burris Laboratory, Waldron, Covenant Christian, Brebeuf, Jeffersonville, South Knox, New Washington, University HS, Cardinal Ritter, Greencastle, Zionsville, Seymour, Crawford County, Seymour, Crown Point and White River Valley. In addition to “Embracing the Future,” University initiatives such as the Lugar Academy encourage high school students to pursue skills in leadership and service. Retired Sen. Richard Lugar, who has hosted the Richard G. Lugar Symposium for Tomorrow’s Leaders on campus for more than 40 years, works with students to identify the most pressing current events and political issues of our time. Ballard, the former two-term Republican mayor of Indianapolis, now serves as a Visiting Fellow for the Institute for Civic Leadership and Mayoral Archives at the University of Indianapolis. He mentors students and creates programming to help them develop leadership and civic management skills. The goal of the Institute is to connect the community with Indianapolis’ civic history by working closely with previous mayors and their staffs to collect and preserve photos, documents and other resources that were critical in establishing Indianapolis as a world-class city. The Mayoral Archives are available digitally at uindy.historyit.com. The Institute hosts the annual Richard M. Fairbanks Symposium on Civic Leadership each year at the University, at which civic leaders and community builders examine a topic important to the future growth of the city. The Indianapolis Quartet, the ensemble-in-residence at the University of Indianapolis, brings their unique musical style to the Indiana Landmarks Center at 3 p.m. on Saturday, Feb. 2, 2019. The Center’s Grand Hall provides an ideal setting for the Quartet’s program, which includes works by Beethoven, Frank Felice and Debussy. Founded in 2016, The Indianapolis Quartet (Zachary DePue and Joana Genova, violins; Michael Isaac Strauss, viola and Austin Huntington, cello) is the ensemble-in-residence at the University of Indianapolis, reaching audiences through its unique musical language and emotional performance style. 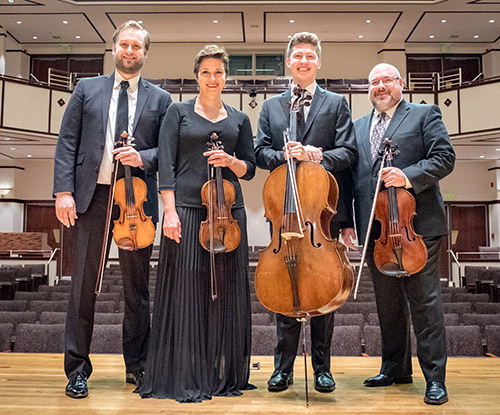 In addition to concerts, masterclasses and open rehearsals at the Christel DeHaan Fine Arts Center, The Indianapolis Quartet performs frequently throughout central Indiana, the Midwest and Vermont, exercising its mission to gradually expand its reach not only regionally, but also nationally and internationally, as it continues to build its repertoire of world-class music. Beethoven’s String Quartet in B flat major opens the concert with an energetic first movement, followed by a beautiful adagio and a playful scherzo, ending with “La Malinconia” – the famous dark introduction of the otherwise joyful finale. Frank Felice’s “Five Whimsies for Non-Grownups,” composed in 2010, is based on five of his favorite children’s books by Maurice Sendak, Dr. Seuss, Chris Van Allsburg and J.R.R. Tolkien. The music is fresh and fun, witty and whimsical. Debussy’s only string quartet filled with stunning melodies, exotic harmonies, drama and vigor will be featured after intermission. Suggested donation is $10, students are free. For more information, please contact Grace Labens at labensg@uindy.edu or 317-788-3255. Click here to learn more about The Indianapolis Quartet. 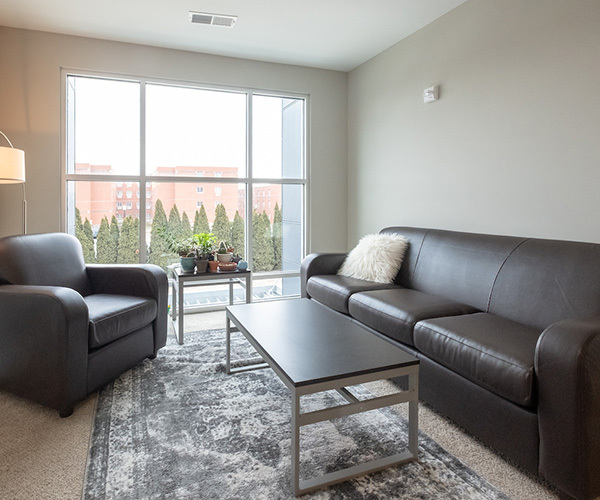 The University of Indianapolis continues to respond to students’ changing needs by developing cutting-edge apartments in partnership with Indianapolis-based Strategic Capital Partners, LLC (SCP). 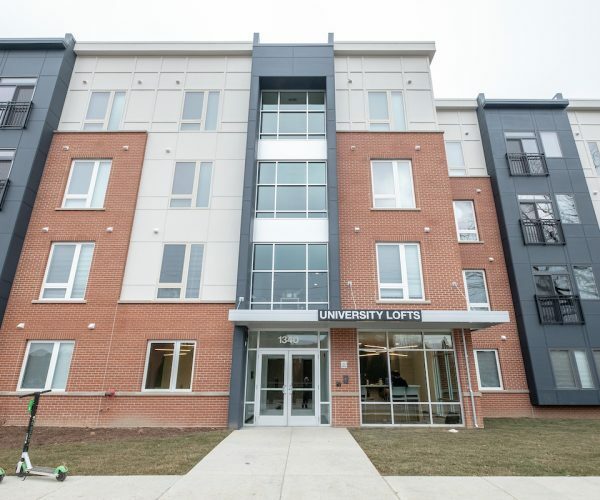 An Open House on Jan. 25, 2019 (noon-2 p.m.) celebrates the first phase of University Lofts, including guided tours of the West Building where students are currently living. 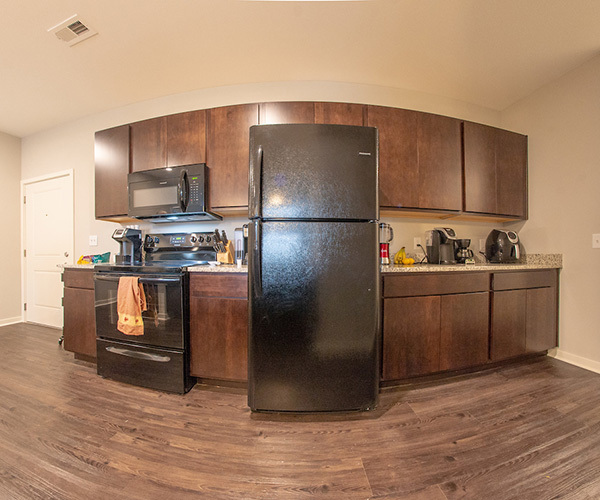 These upscale units, which add 300 beds to meet growing student demand for high-quality living options adjacent to campus, continues the trend started with the addition of Greyhound Village in 2016. 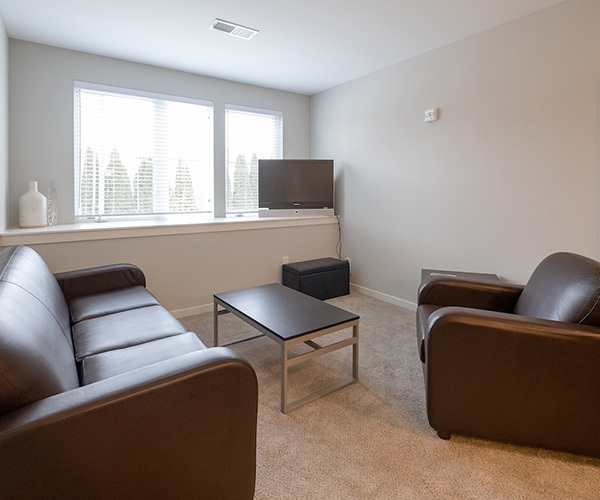 Featuring innovative and adaptable common areas, universal wi-fi connectivity, and a variety of unit styles to address unique privacy and living arrangements, University Lofts more closely resembles a modern urban, mixed-use apartment complex than a traditional residence hall. 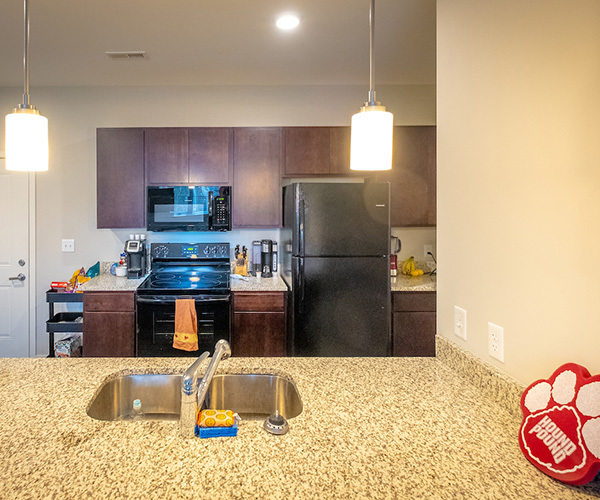 University Lofts is a 118-unit apartment complex offering furnished single, double and quad rooms with private baths, kitchens, living areas, and washers and dryers. The complex sits on nearly two acres of land developed by a joint venture between SCP and the University. 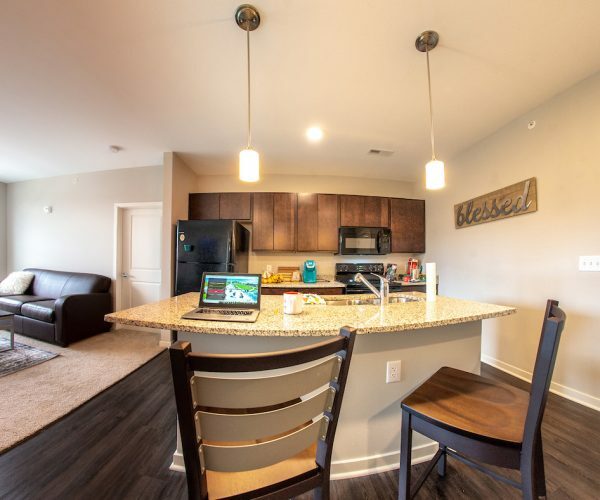 University Lofts, located at 1340 National Avenue, is adjacent to campus and only a short walk from the city’s planned rapid transit bus Red Line which will connect the University to downtown Indianapolis, the north side and popular entertainment districts. 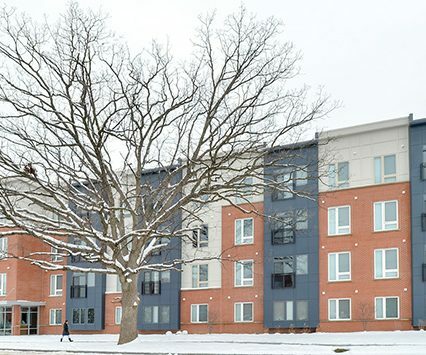 Just nine months after the groundbreaking celebration, student residents are settled in and eager to show others their new home during a campus open house. The $20.5 million investment in University Lofts is a testament to the University’s commitment to the campus and neighboring communities. 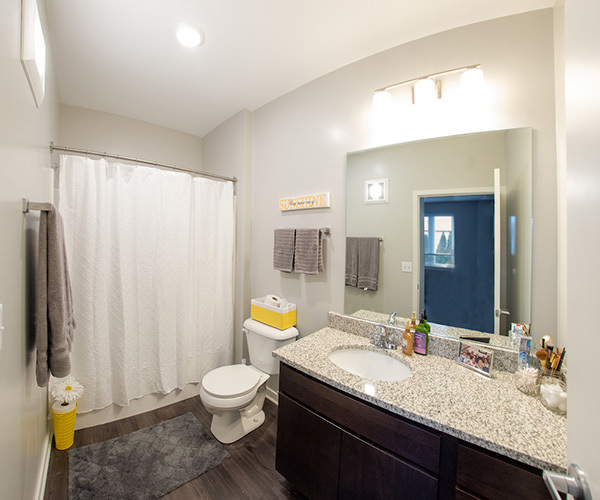 Creating a quality complex like University Lofts requires talent and experience. 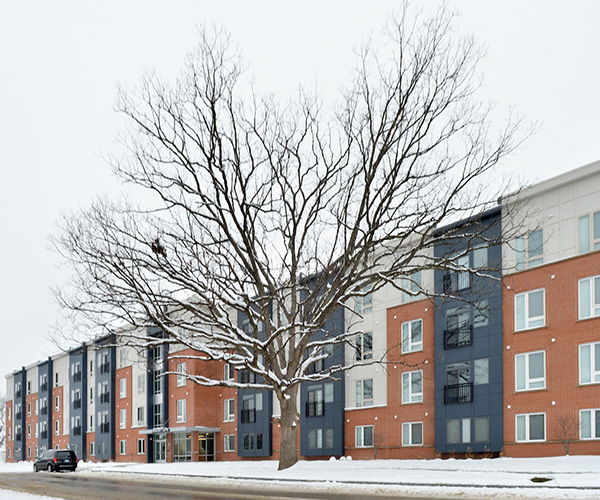 SCP was proud to partner with CSO Architects and Compass Commercial Construction Group to design and build the project, and has hired Peak Campus to manage University Lofts. 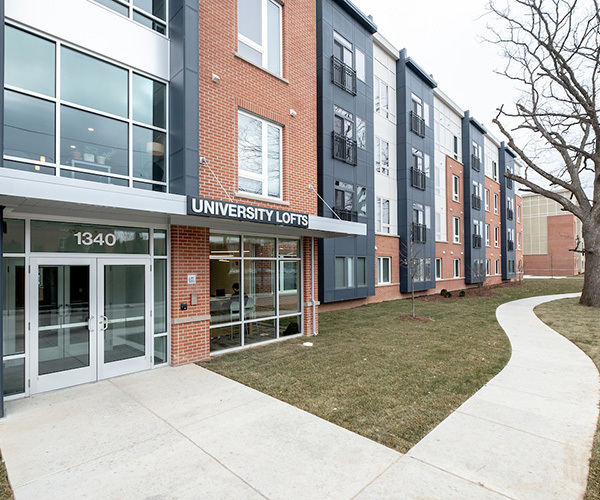 University Lofts is the second housing collaboration for SCP and the University. 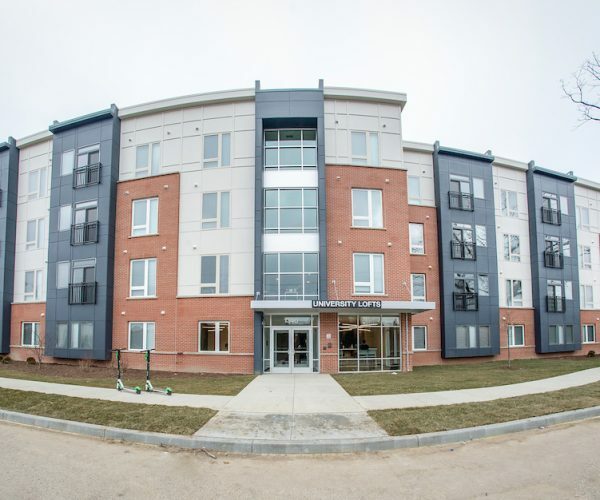 Greyhound Village, which opened in 2016, is a 4-story building with 196-units housing up to 480 students. 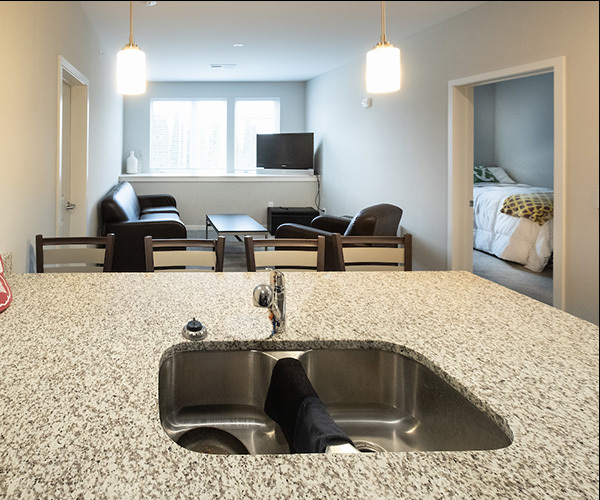 Greyhound Village features a mix of furnished one, two, three and four-bedroom units with private baths, kitchens, living areas, and washers and dryers, and is also managed by Peak Campus. Strategic Capital Partners, LLC (SCP) is a commercial real estate developer who invests in, develops, owns and operates properties in top tier submarkets in Charlotte, Cincinnati, Indianapolis, Nashville, Northern Virginia and Raleigh/Durham. SCP is the general partner in more than $700 million of office, industrial, multi-family and student housing properties which total nearly six million square feet. The SCP team includes real estate professionals with many years of industry experience in private equity, development, banking, property management and brokerage including Gene Zink and Richard Horn who were both long-serving senior executives at Duke Realty (NYSE:DRE). For more information, please visit www.strategiccapitalpartners.com. The University of Indianapolis, founded in 1902, is a private, liberal arts university located just a few minutes from downtown Indianapolis. 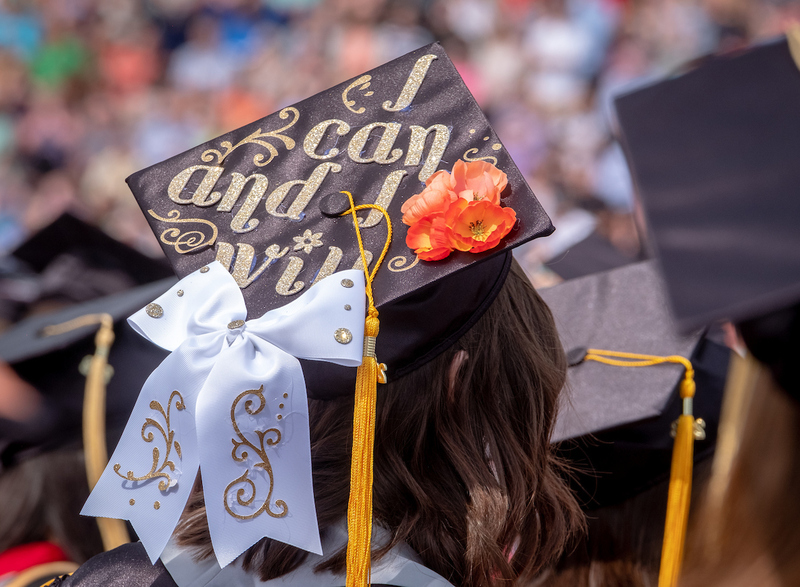 UIndy is ranked among the top Midwest Universities by the U.S. News and World Report, with a diverse enrollment of more than 5,500 undergraduates, 1,300 graduate students and 400 continuing education students. The University offers a wide variety of study areas, including 100 undergraduate degrees, more than 40 master’s degree programs and five doctoral programs. With strong programs in the health sciences, engineering, business and education, UIndy impacts its community by living its motto, “Education for Service.” www.uindy.edu. 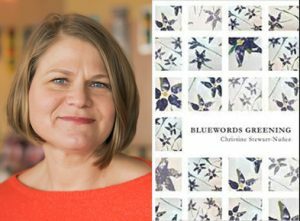 Etchings Press, the University of Indianapolis student-run publisher, has announced the recipients of the 2018 Whirling Prize. The Whirling Prize welcomes submissions of published books related to specific themes that change annually. The 2018 prize focused on the theme of disability. University of Indianapolis Department of English students reviewed 38 submissions and selected winners in the categories of prose and poetry. The winners will receive a $500 honorarium and 25 copies of a letterpress broadside designed by student artists of UIndy’s Hullabaloo Press. Posters will be available for purchase in March 2019. Winners and judges will record an episode for The Potluck Podcast: UIndy & the Arts, which will be available to listeners in March 2019. For updates, follow @uindyetchings on Instagram, Twitter, and Facebook. 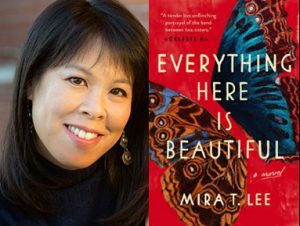 The theme for the 2019 Whirling Prize will focus on issues central to space. Students are employing a broad interpretation of this criteria in their reading and judging and are especially interested in reading books with a focus on relationships with our universe. All writers focusing on related topics who have published their books since January 1, 2017, are welcome to participate. The deadline for submissions is September 2, 2019. Details may be found on the Etchings Press website. 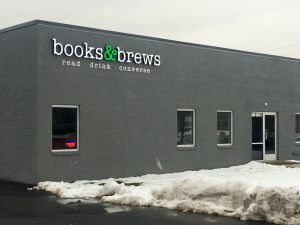 INDIANAPOLIS – The University of Indianapolis, Quest Food Management Services and Books & Brews will begin providing meals to those local employees and their immediate family affected by the federal government shutdown at the Books & Brews (South Indy) starting Thursday, Jan. 17, 2019. With the University’s long history of engagement and collaborations with business partners and organizations to contribute to the quality of life in the city, President Robert L. Manuel said it was natural for the University to find a way to assist members of the community. Federal employees may present their government ID at Books & Brews (South Indy) at 3808 Shelby Street. Meals will be available at this location Monday through Friday from 11:30 a.m. to 1:00 p.m. beginning Thursday, Jan. 17 (one meal, per person, per day). Meals are prepared by Quest Food Management Services. Parking is available on-site. For more information, please contact 317-788-3530. More than 400 high school juniors from 70 counties across Indiana attended the 42nd annual Richard G. Lugar Symposium for Tomorrow’s Leaders at the University of Indianapolis. Schools from across the state select three students to attend the Symposium each year. More than 400 students from 70 counties across Indiana participated in 2018. The event offers students a chance to gain valuable insight from Lugar and explore the current state of national and international issues. The event exposes some of the brightest young minds in Indiana to the complex issues facing the country and world. In addition, students are able to visit with Lugar personally, providing them lessons in leadership and community service. North Korea and Nukes: Is There a Solution? The event also recognized Charles C. Chiang of Zionsville Community High School as this year’s recipient of the Richard G. Lugar Distinguished Student Leadership Award. The $1,000 award recognizes one Indiana high school senior each year for leadership and community service activities. After two terms as Mayor of Indianapolis, Lugar served for 36 years in the U.S. Senate, including leadership roles in the Committee on Foreign Relations and the Committee on Agriculture, Nutrition and Forestry. He is the current president of The Lugar Center, a nonprofit organization based in Washington, D.C. that convenes thought leaders on topics such as global food and energy, security, governance and international aid programs. More information on the Symposium can be found here. More than 15,000 promising students have participated in the Lugar Symposium during the past 40 years, including nearly 500 students last year, gaining wisdom, insight and access to some of the finest minds available. Principals from every high school in Indiana are asked to select three outstanding student leaders from their junior class to attend the Symposium. Lugar is a Distinguished Trustee, a former professor of political science and holds an honorary degree from the University of Indianapolis. The symposium that bears his name was launched in 1977 as an opportunity to discuss with students topics of local and global importance. 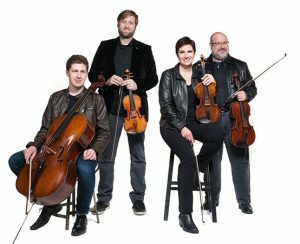 On the heels of summer festival and radio appearances, The Indianapolis Quartet (TIQ) returns to the Christel DeHaan Fine Arts Center on October 1 at 7:30 p.m. Their third season of concerts will get underway with a program that continues their exploration of the Beethoven quartets, an award-winning work by New York City-based composer Robert Paterson and Schoenberg’s groundbreaking string sextet and features performances by two guests from the Indiana University faculty. The concert, part of the Faculty Artist Concert Series sponsored by Katz, Sapper & Miller, is open to the public and admission is free. TIQ’s palpable rapport and interpretive skill bring about concert experiences of a unique musical language and emotional performance style that has earned the group critical praise and audience appeal. First violinist Zachary DePue, former concertmaster of Indianapolis Symphony Orchestra (ISO), is in demand as a leader, soloist, collaborator and improvisational artist. Second violinist Joana Genova is assistant professor at the University of Indianapolis and recently appeared as soloist under the baton of Maestro Raymond Leppard. Violist Michael Isaac Strauss was principal of ISO for 20 years. He now performs around the country in chamber music settings and devotes significant energy to developing young violists. Prize-winning cellist Austin Huntington was appointed principal of the Indianapolis Symphony Orchestra at the age of 20 and now also serves on the faculty at UIndy. The evening opens with Beethoven’s dramatic String Quartet in C Minor, Op. 18, No. 4 noted for its stormy first movement; playful, innocent scherzo; an innovative minuet; and a gypsy-style finale. Robert Paterson’s String Quartet No. 1, nicknamed the “Love Boat,” consists of four high-energy miniature movements, mixing elements of jazz, fiddling and polka. It even contains a few short musical “quotes”—the most notable is the theme song from the 1970s and ’80s television show, The Love Boat. Violist Atar Arad and cellist Eric Kim, both on the faculty at the Indiana University Jacobs School of Music, will join TIQ for Arnold Schoenberg’s landmark sextet, Verklärte Nacht (“Transfigured Night”), Op. 4. Written in 1899, when the composer was only 25 years old, the work is the first piece of programmatic chamber music. It is a musical representation of a poem of the same name by the German writer Richard Dehmel. The music is warmly and expansively Romantic, giving no hint of the “twelve-tone” style with which Schoenberg was to become identified only a dozen years later. TIQ is quartet-in-residence at the University of Indianapolis and is grateful for support from the Christel DeHaan Family Foundation. More information can be found at events.uindy.edu or by calling 317-788-3255. The University of Indianapolis brings a wide range of diverse cultural activities to the Indianapolis metropolitan area with the announcement of the 2018-19 performing arts season. The institution serves as a destination point for music performances, theatre productions, art exhibitions, readings and lectures, and highlights a progressive arts and musical scene in the region. Fall performances include the Indianapolis Quartet, Artist-in-Residence Raymond Leppard’s Gala Opening Concert, the UIndy Jazz Faculty debut and pianist Artist-in-Residence Drew Petersen. See events.uindy.edu for event details and ticket information. University Faculty Concert Series is sponsored by Katz, Sapper & Miller. All performances held at 7:30 p.m. at the Ruth Lilly Performance Hall in the Christel DeHaan Fine Arts Center. Featuring Raymond Leppard; Joana Genova, violin; Kathleen Hacker, soprano; Mitzi Westra, mezzo-soprano; Daniel Narducci, baritone; University of Indianapolis Festival Orchestra; University Choral Ensembles. Maestro Raymond Leppard celebrates his 25th season as artist-in-residence with music of J.S. Bach, Mozart, Britten, and the premiere of his own recently completed song trilogy, “Love’s Moonlight.” The program opens with Britten’s Sentimental Sarabande from the 1934 Simple Symphony, followed by UIndy’s Joana Genova performing Bach’s E-Major Violin Concerto, BWV 1042. Mitzi Westra and Daniel Narducci will be featured in Mr. Leppard’s new song cycle for solo voices, string orchestra, and choir, set to poetry of Thomas Campion and Walter de la Mare. The evening concludes with the glories of Mozart: selections from the Vespers, K. 339, and the Ave verum corpus, K. 618. 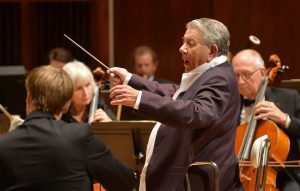 Maestro Leppard, one of the most respected international conductors of our time, has appeared with practically all the world’s leading orchestras in more than 60 years on the podium. He has conducted more than 170 recordings, earning five Grammy awards, a Grand Prix Mondial du Disque, a Deutsche Schallplattenpreis, and an Edison Prize. Featuring Zachary DePue and Joana Genova, violins; Michael Isaac Strauss, viola; Austin Huntington, cello; with guests Stephen Paul Wyrczynski, viola, and Eric Kim, cello. The Indianapolis Quartet returns for its third season of “marvelously unified” and “especially expressive” performances (Jay Harvey Upstage). Robert Paterson’s award-winning String Quartet No. 1 (“Love Boat”) opens the program, followed by the compelling drama of Beethoven’s C-minor Quartet from Op. 18. The evening concludes as guests Stephen Paul Wyrczynski and Eric Kim join the Quartet for Arnold Schoenberg’s landmark 1899 sextet, Verklärte Nacht (“Transfigured Night”), Op. 4. The Quartet, which formed in 2016, is the result of a collaboration between the University and the Indianapolis Symphony Orchestra. The project was made possible, in part, through a transformational gift by University trustee and philanthropist Yvonne Shaheen, namesake of the Shaheen College of Arts & Sciences, and was awarded a $100,000 grant from the Christel DeHaan Family Foundation in 2017. Acclaimed American pianist Drew Petersen is a sought-after soloist, recitalist, and chamber musician in the United States, Europe, and Asia. 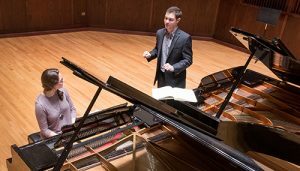 In his second year as artist-in-residence at the University of Indianapolis, Mr. Petersen is the 2017 Christel DeHaan Fellow of the American Pianists Association and the recent recipient of a prestigious Avery Fisher Career Grant. He has been praised for commanding and poetic performances of the repertoire ranging from Bach to Zaimont. His October solo recital will feature music of Mozart, Beethoven (the Appassionata Sonata, Op. 57), and Liszt (including the rarely performed Illustrations du Prophète de Meyerbeer). Other fall highlights include the UIndy Jazz Faculty Debut on Sept. 24; a rare exhibition of the works of Wilbur D. Peat at the Christel DeHaan Fine Arts Center Gallery Sept. 10-Oct. 5 (reception: Sept. 24); Kellogg Writers Series fiction reading by John Jodzio Oct. 3 at the Schwitzer Student Center; and “It’s a Wonderful Life, The Radio Play” Nov. 30-Dec. 8 at the Studio Theatre in Esch Hall. See a complete list of the UIndy 2018-19 performing arts season at events.uindy.edu. INDIANAPOLIS (August 30, 2018) ─ Roche Diagnostics and the University of Indianapolis are partnering to create a custom talent pipeline for biomedical equipment technicians through the newly created Roche Academy. The partnership was co-developed with Ascend Indiana, a Central Indiana Corporate Partnership (CICP) initiative. As Roche’s customer base continues to grow, the demand for quality and properly trained biomedical equipment technicians continues to increase. These technicians are critical to Roche’s operations, as they maintain critical lab equipment and provide customer service across Roche’s 32 geographic service regions. Through this partnership, the University will recruit biology and chemistry students to join the Roche Academy, where they will complete a Roche-customized curriculum path and summer internship experience focused on the hands-on, life science and engineering skills necessary for employment at Roche. In exchange, Academy students successfully completing the program will receive financial and educational incentives, including a job offer from Roche upon graduation. The partnership also allows the University to align its curricula with current industry demands for education and attract new students to the university. Ascend, Roche and UIndy will begin recruitment for the first cohort of students in October, with the first class estimated to start employment at Roche in 2020. The Academy is expected to produce 20-25 biomedical equipment technicians for Roche annually. Roche Diagnostics is the North American headquarters of the world’s largest biotech company where more than 4,000 people work together to provide insights that help people around the world manage and improve personal health conditions. It has been part of the Indianapolis landscape since 1964 when it was founded as Bio-Dynamics and later acquired by Boehringer Mannheim Corporation in 1974. Roche acquired Boerhinger Mannheim in 1998 and within three years became the world leader in diagnostics. Ascend Indiana seeks to ensure every Indiana employer has access to the skilled workforce necessary to thrive, and every Indiana citizen has the opportunity to pursue a meaningful career. Ascend is a catalyst across industry sectors to help connect the supply of skilled talent to demand from employers through scalable programs and innovative solutions. To learn more, visit ascendindiana.com. Roche is a global pioneer in pharmaceuticals and diagnostics focused on advancing science to improve people’s lives. The combined strengths of pharmaceuticals and diagnostics under one roof have made Roche the leader in personalized healthcare – a strategy that aims to fit the right treatment to each patient in the best way possible. Roche is the world’s largest biotech company, with truly differentiated medicines in oncology, immunology, infectious diseases, ophthalmology and diseases of the central nervous system. Roche is also the world leader in in vitro diagnostics and tissue-based cancer diagnostics, and a frontrunner in diabetes management. Founded in 1896, Roche continues to search for better ways to prevent, diagnose and treat diseases and make a sustainable contribution to society. The company also aims to improve patient access to medical innovations by working with all relevant stakeholders. Thirty medicines developed by Roche are included in the World Health Organization Model Lists of Essential Medicines, among them life-saving antibiotics, antimalarials and cancer medicines. Roche has been recognized as the Group Leader in sustainability within the Pharmaceuticals, Biotechnology & Life Sciences Industry nine years in a row by the Dow Jones Sustainability Indices (DJSI). The Roche Group, headquartered in Basel, Switzerland, is active in over 100 countries and in 2017 employed about 94,000 people worldwide. In 2017, Roche invested CHF 10.4 billion in R&D and posted sales of CHF 53.3 billion. Genentech, in the United States, is a wholly owned member of the Roche Group. Roche is the majority shareholder in Chugai Pharmaceutical, Japan. For more information, please visit www.roche.com or www.RocheIndy.com. Announcing a new two-day schedule for May 2019!